The following data was tracked from Game 5 of the Anaheim Ducks vs. Chicago Blackhawks series. Given that Game 7 is also at Anaheim, this information may be useful for insights into how the matchups on Anaheim’s home ice affected the teams’ performances. The following data is for 5 on 5 play only during Game 5 in Anaheim. Dump ins include chip and chase entries as well as traditional dump ins from the neutral zone. Carry in entries include both entries accomplished by carrying the puck into the offensive zone on your stick as well as a short direct pass from the neutral zone to a player entering the offensive zone. The player making the pass is credited with the carry in for that situation. Over the course of the season, I and others have often talked about the importance of defensive zone exits. On numerous occasions, we have debated (on Twitter) the pros and cons of simply getting the puck out of the zone to relieve offensive pressure versus starting a proper breakout play. People often argue that because players are tired at the end of a shift, particularly one where they have been actively defending for an extended period, simply getting the puck out of the zone without icing helps the team. To execute a line change. Zone Exits and actions taken in the defensive zone are the most intriguing part of microstats to me. I am admittedly a bit obsessed with defensive systems and shot suppression so this is probably not surprising. Defensive zone microstats are key to evaluating players, systems and teams. They can help teams identify areas of weakness or strength in players. In turn, defensive zone microstats can be used to tweak systems to better exploit the strengths of the defensemen and insulate the risks associated with their weaknesses. While tracking zone entries, I include the defenseman targeted on the entry. I also keep track of whether a forward assisted on defending against the zone entry. This data can help evaluate team and player performance as well as the efficacy of the systems used by the teams. This is particularly true of a team’s neutral zone forecheck, or the system they use to stop the attacking team from entering the zone. Zone targets are heavily dependent upon time on ice, so please keep that in mind while reviewing this information. Targeted D: Defensive player responsible for the side of the ice through which the attacking player tries to enter the zone. This may also be the player pressuring the puck carrier at the blue line or the player filling in for the defensive player on an oddman rush or breakaway. 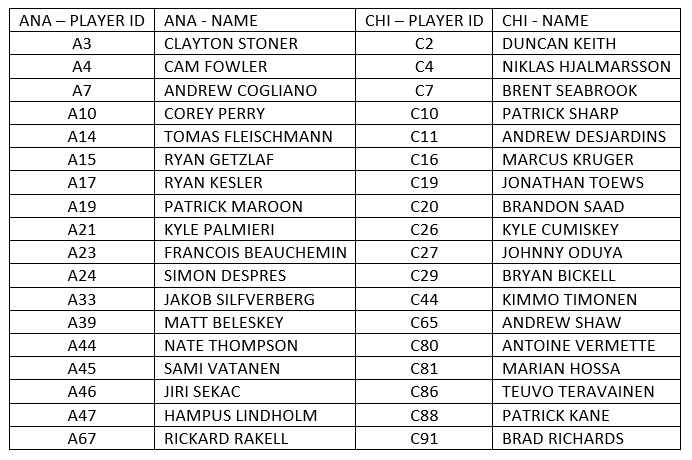 Now that the team breakdown is complete, we can move on to the player breakdown of the zone entries throughout the Chicago versus Nashville playoff series. Aside from telling you how each of the players fared during the series, I also want to show you some of the possibilities for using the information tracked through microstats (such as zone entries and exits) to evaluate players, line combinations and systems. I initially wanted to put all of the data I tracked from the Chicago vs Nashville series in one post; however, that would be massive and lose a lot of meaning that way, so I am breaking it down. I plan to post 5 articles as of right now. If one of them gets too long, I’ll break it down further.